According to the Quintana Roo News- Novedades, ¨The Tourist Police will once again visit the company Calmecac, to update the ISO 9001:2008 certification, the importance of this evaluation is that it will assess, among other things, the English proficiency of its elements that have been suggested by the business sector. Juan Carlos Perez Larios, director of the Tourist Police, said the audit Calmecac be on Tuesday and Wednesday this week and hope to pass with minimal to recertify the 40 members of the corporation, whose average is 70 percent English proficiency. Cesar Navarro Medina entrepreneur and leading restaurateur, and Jane Groman, spokeswoman for the Tourist Business Committee (TEC), have questioned the expertise of the police in English, since the provision of municipal authority about alcohol consumption on Fifth Avenue has reported several foreign tourists to be experiencing difficulty with communication. Although the tourist police will evaluate aspects such as equipment and facilities, management of foreign languages, especially English, is fundamental to achieving the ISO. According to Perez Larios, the average knowledge has held since November 2009, although it has been low and staff additions, and even two of its elements know a second language: Italian and German. He said that until now employers "have not come to me with those comments that cause problems for the tourists themselves to be uncomfortable with the situation that was established because it directly affects business, but I had no such complaints, always has been directed so attentive. We had no complaints about it, " he said repeatedly. 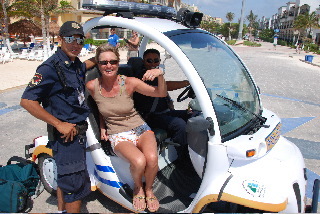 In October 2009, when Ventura Rubicel Avalos was director of the Tourist Police, said in a statement issued officially by the community to get the ISO, the elements of the police division should be 100 percent in the English language, and now have 70 percent of ownership.